Is Your Bank A Schmoo? Anyone of cartoon watching age in the early 1980s may remember "The New Shmoo." It was an animated series about a white blob reminiscent of a fat bowling pin. The Shmoo worked alongside a group of teenagers to solve crimes. In the series, Shmoo had the unique ability to shift into virtually any shape he wanted. Interestingly, before he was "new," however, Shmoo was already 31Ys old. You see he had initially been created in 1948 for a story line in the comic strip Li'l Abner. Shmoo-mania got so crazy in the 40's that within a year of their introduction, nearly 100 different licensed Schmoo-shaped products were created. Society's rapid embrace of the original Shmoos, coupled with the ability of the "new Shmoo" to change into almost anything, made us think about the recent decision of regulators in the UK to grant a banking license to a bank that will operate solely through a mobile application. Atom Bank is in the process of creating a low-cost, full-service bank that will initially operate entirely through a mobile banking application and it has just been granted the seal of approval to operate as an official bank. Atom Bank was created by two former bankers eager to capitalize on consumers' ever-increasing use of mobile banking. 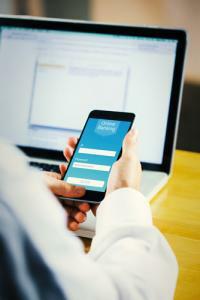 Though Atom Bank's primary focus is on its mobile banking app which will feature biometric security, as well as the ability for users to open accounts within the app, there are plans for the eventual inclusion of desktop capabilities as well. The new mobile bank, which hopes to launch its application to the general public later this year, already boasts ?25mm in capital. But before it can officially launch to the public, Atom Bank must first raise an additional ?75mm to comply with British regulatory requirements. That task will likely prove significantly easier now that it has a banking license under its belt. While Atom Bank will operate without physical branches, customers will be able to contact its staff through email, phone and social media. The upstart mobile bank currently employs roughly 100 staff members and plans to add another 60 by the end of this year. Atom Bank's founders have also said customers will be able to make physical deposits and withdrawals through the ATMs of a UK banking chain - the identity of which they have yet to reveal. In addition to mobile pay options, the bank has said it may utilize an online payment service such as Apple Pay to make it easier for customers to pay for online purchases. One factor almost certainly leading to Atom Bank's ability to secure a banking license is that in 2013, the British government made a concerted effort to encourage greater competition within its banking industry. It has even eased its licensing requirements for prospective banks, including the amount of capital required. Here in the US, mobile banking is proving equally important to consumers. So, an important question for the US banking industry is whether a purely mobile bank could get licensed as a legitimate bank here. Given the regulatory environment in the US banking industry and the resulting dearth of new banks, it seems unlikely that Atom Bank will see a US counterpart anytime soon. As community banks do their best to be like Schmoos and shift their shapes to meet the rapidly changing demands of customers and regulators, we are interested as well in what tomorrow brings. It will be interesting to see how it goes with the adoption (or not) of the entirely mobile Atom Bank in the UK so we will track it and report back in a future edition. In the meantime, keep doing what you do as you modify your shape to capture ongoing business. Treasury yields were mostly unchanged after a day of wild gyrations in stock prices due to the Chinese currency devaluation. Numerous economic releases including retail sales and import prices. 1) Fidelity National Information Services (FIS) will acquire SunGard Data Systems for $91.B. 2) Capital One Bank will acquire the healthcare financial services business of GE for about a 6% premium. Networking company Ubiquiti Networks said cyber thieves stole $46.7mm using a fraudulent scam that led to unauthorized international wire transfers. Under the scam, an employee was impersonated using email. While details were not provided, this scam typically is an email that appears to be from the CEO authorizing the wire transfers and coming from their email domain name. Bankers should be aware this scam is more prevalent now and take precautions to follow procedures tightly. FDIC Vice Chair Hoenig said in a speech that he recommends regulatory relief be provided to institutions not based on asset size, but rather that meet certain criteria such as: holding no trading assets or liabilities; holding no derivative positions other than interest rate and foreign exchange derivatives; having a total notional value of all its derivatives exposures (including cleared and non-cleared) of less than $3B; and maintaining a ratio of GAAP equity-to-assets of at least 10%. A Wells Fargo survey of small businesses finds 51% that accept point of sale card payments are not aware of the change in chip card liability that kicks in Oct 1. As of that date, card issuers and merchants who do not upgrade their point of sale system to accept EMV cards assume liability for fraudulent transactions. Most worrisome, of those who said they were aware of the pending liability shift (49% of respondents), about 20% said they did not plan to upgrade and were not concerned about it or did not want to pay for the upgrade. Through 2Q, banks have announced 145 mergers vs. 144 at this point in 2014. Of those announced so far, about 85% involve sellers with assets of $500mm or less. CNBC reports a survey by the American Psychological Association finds money is cited as the leading cause of stress among American households. Further, 31% of adults said it was a major source of conflict in their relationship. A report by 451 Research projects the global installed base of mobile point of sale technology will jump 400% in the next 4Ys.